Retro: Jack's 1930s memories of Sheffield - hospitals, holiday fun and tipsy choirboys! The last instalment of Jack Hambleton’s memories of Walkley from the 1920s onwards looks at childhood illnesses and the highlights of winter. Scarlet fever was one of the many ailments of the Thirties. Children catching the infection were taken to Lodge Moor Isolation Hospital. At six years of age I caught the disease. Each child in the hospital was given a patient number. Parents had to be content during the week by reading of the patient’s condition through his number in hospital bulletins printed nightly in The Star newspaper. Long, dark, cold winter evenings were mostly spent in the house in the small living room sitting in front of a blazing coal fire, reflections of the flames mirrored in the brass fender. Sunday teatime mother would cut thick slices of bread for father to place on a brass toasting fork in front of the fire. When it snowed, children were outside sledging, much to the annoyance of the grown-ups. We sledged, they slipped. November brought the exciting Guy Fawkes Night. People with the biggest backyard organised a bonfire. Mothers brought potatoes for baking or flat tins of sticky bonfire toffee. Others brought slices of parkin (ginger cake). Fathers supervised the setting off of Big Demon and Little Demon banger fireworks. The swish of rockets set off in a milk bottle, soaring into the night sky, brilliant colours cascading from whirling Catherine Wheels pinned on the privy doors. The glowing Roman Candles raised an appreciative ‘Ooh’ and ‘Aah’. 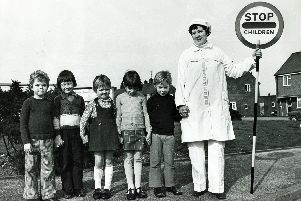 Younger children wrapped up in warm clothes, mufflers round their necks, were allowed to wave sparklers. On November 11, the anniversary of Armistice Day, we were reminded of the Great War, having ended in 1918 and of the thousands of service personnel having given their lives fighting for the defence of our country. Schoolchildren paraded to St Saviour’s Church to attend a memorial service. At the stroke of 11am, almost the whole country came to a standstill. People stood in silence for two minutes, bowing their heads in respect. Christmas was the highlight of the year. Grocery shops displayed tinned biscuits and boxes of crackers and dried fruit and mincemeat in abundance for the making of cakes, puddings and pies. Cotton‑wool snow and a cardboard Santa Claus looked out at you from the shop windows. A piece of pork and maybe a chicken were bought at the last moment on Christmas Eve, from the butcher who, wanting to ‘shut shop’, had reduced his prices. Being in the church choir we had to go round carol singing, visiting upstanding parishioners’ houses. Earlier that day in 1937, one of our pals’ sister had got married. We started off at his home where the wedding reception was being held. As we sang God Rest Ye Merry Gentleman we were given generous glasses of port wine. As 13-year‑olds, and being not used to that type of beverage, we eventually arrived at the other god‑fearing Christian households in a more than jolly mood, giving them the greatest performance of our young lives. Strong complaints from these ‘Christians’ were made to the vicar. After the following Sunday morning service we were lined up by the Reverend and given a stern lecture about the evils of the demon drink and made to sign the Band of Hope Pledge. Christmas morning and the excitement of delving into the ‘stocking’ which was a pillowcase hung at the bottom of the bed. It did not contain a lot but what we did receive was treasured. A chocolate smoker’s outfit, or a chocolate selection box, and maybe a toy conductor’s set. It was also traditional to receive an orange, apple and a new penny. When the Christmas dinner was over we were too full to move. Having washed all pots and dishes, everyone settled down for a very important Christmas occasion – The King’s Speech – coming out of the accumulator-powered wireless set. Boxing Day was party day with families holding parties lasting until the early hours of the next morning. Then they would walk miles in safety to their homes which could be on the other side of the city. The Christmas festivities ended a few days later with my mother and her friend taking a gang of us to see the pantomime at the Lyceum Theatre. Standing outside the back entrance to the theatre, shivering in the cold, we eagerly awaited to go in, then excitedly running up the never-ending stone steps to the ‘Gods’. From our seats high up we looked down on what appeared to be a miniature stage. The smell of oranges being peeled wafted around, and the crunching of nuts, the eating of what was left of the chocolate selection box received in your Christmas stocking. The lights of the theatre dimmed then faded out and the orchestra suddenly struck up playing an overture of the day’s popular tunes. The velvet curtain rose and the stage was transformed into a mass of colour. Beautiful dancing girls in glittering costumes, on their heads feathered plumes, singing and transporting the audience into a world of fantasy, if for only two hours. Children cheered the hero and his princess and booed the villain. Custard pies being thrown around the stage brought the kids out of their seats. My mother and her friend cried their eyes out at Tessie O’Shea’s sad rendering of The Little Boy that Santa Claus Forgot, only cheering up when the audience was singing Let’s All Sing Like the Birdies Sing. Coming out of the theatre after the show, we called at the Little Pie Shop in Orchard Street, for pie ’n’ peas, before returning home on that ever-faithful blue and cream-painted tramcar. On South Road (the Top Road), St Mary’s Church and the Ebenezer Methodist Chapel still proudly stand. The Palladium Picture Palace with its nostalgic memories of the Saturday morning Tupp’ny Rush was demolished some years ago to be replaced with a concrete monstrosity of a supermarket. It stood derelict for many years before becoming a car showroom then finally a supermarket. The tramcars clanging along the road and almost onto the pavement have long since disappeared, to be replaced by diesel-fumed motor buses and traffic jams. The Howard Hotel at the side of the entrance to Birkendale, the watering hole favoured by the local dentist, and the gents outfitter, together with Grandma’s Beer‑Off at the top of Fulton Road, have long since gone, demolished to leave empty spaces for the older generation to remember them by. Mr Thompson’s newsagents shop across the road is now a house. Those caring nuns of St Joseph’s Convent, dressed in long dark gowns and wearing their unusual hats, are now just a memory. With the advancing years, Industry Street has changed. Many small terraced houses, no longer tenanted but privately owned, still stand. Some have disappeared to be replaced by modern semis. The characters, Irish Jack and Granny Allen, and others that made the street vibrate with life in past decades are now but a distant memory. Mrs Saunby’s shop, as well as the corner shops, have been converted into houses. The street has even been cut in two, sectioned into a top half and a bottom half. The gasometers no longer still appear to loom behind the bottom houses. Today’s children cannot play their games in the street. It is full of parked motor cars. While Big Bill and Little Bill would have great problems getting their old coal lorry up the street, they are not now needed. It is a smokeless zone. ‘Pop’ Clayton, the fishmonger, pushing his barrow up the street. Old ‘Bobby’ Cadman, who on his beat, chased us up the passages for playing ball in the street, has disappeared. Today’s modern policemen scurry around in their Panda cars, appearing from nowhere, and going nowhere. It was a happy and carefree time for the children. n Jack’s reminiscences have brought happy memories to Retro readers, who have been in touch to say how much they enjoyed reading them. John Scholey sent in a photograph of St Joseph’s Catholic Convent School. He wrote: “The photo is from the 1890s and my grandmother, Ellen McClory, who was born in 1888, is bottom right in the photo. You can see one of the nuns in all her finery. “My mother, Mary Scholey, would have been a contemporary of Jack Hambleton as she was born in 1920 and I too was brought up in Walkley with my sister Anne 20 years after Jack in the 1950s. “Our house, bought by my great grandfather, Thomas McClory, at the top of Fir Street in around 1870 is still in our family and my sister and her husband, Anne and Peter Smith, live there to this day. “Some of the shops Jack mentions were still there in my day – Maypole grocers and Boots the Chemists – and I also remember the Pikelet Shop at the end of South Road, near the famous bacon shop. “The Walkley Palladium on a Saturday morning was still a highlight of the week. Then there was Hawksford’s the haberdashery shop, where the fireplace shop was until recently. Barrington McCabe wrote: “My Nanan’s house was no 137 on the corner of Walkley Street and Industry Street. My father was born there in 1922. My grandad died in 1944 and Nanan McCabe in 1965.